All standard flash apparel is manufactured to ASTM 1506-98 & complies with OSHA 1910.269 & current NFPA 70E. ASC manufacturers a complete range of arc flash apparel from 8-100 Cal. ASC's arc flash hood with dual fan unit features two light weight fan units that run on two 9-volt batteries and the fans are attached with FR hook and loop for ease of removal. 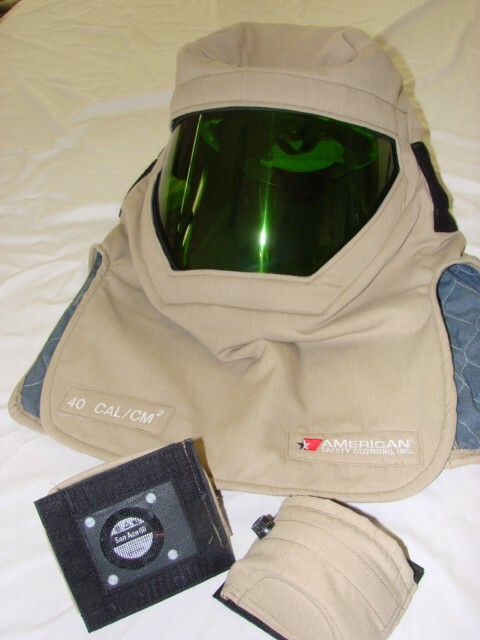 The hood provides the user a gentle and quiet breeze that keeps the worker cool and decreases hazardous effects of oxygen depletion and lens fogging. The hood is engineered to prevent neck fatigue with its lightweight dual fan system design. The fans effectively reduce heat stress by allowing air to circulate for a cooler, more comfortable work atmosphere.